Just wanted to show you another example of why I like clear jewels. 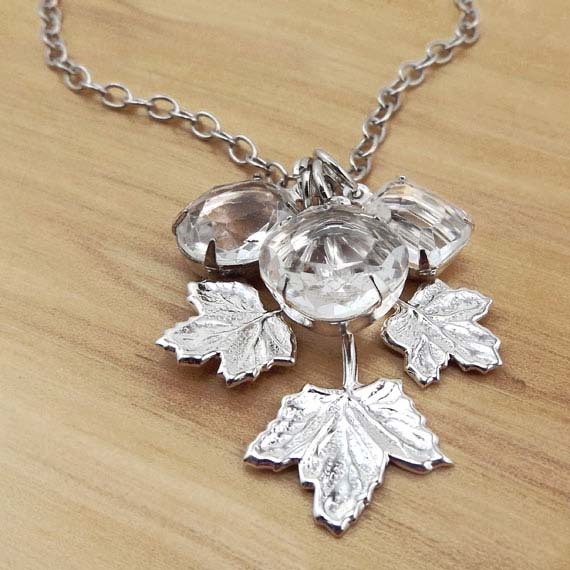 Combined with this silver leaf charm, the clear glass creates sparkle that’ll go with anything. I’m going to try the silver leaf with some colors too – but clear glass, when it’s well faceted and nicely set, just looks good. And it’s easy. I’m all about simple and easy. I ran across this shop totally by accident – and I LOVE it. Think about it – not only is activeweare useful, but your daughter will love wearing her Mommy-and-me clothes. This just strikes me as a terrific idea on so many levels. It’s a great gift for Mom – from her daughter (okay, an older daughter) – or from grandma – or from her Significant Other. (It doesn’t cost a lot, it’s going to fit – leggings are pretty forgiving if they’re anywhere near the right size…) – and it’s something she can share with Her Kid. These are all important concepts! I found them at Malin Boutique on Etsy. It’s a new(ish) shop that definitely needs to be explored and encouraged. Cute activewear – and stuff you can share with your daughter. This is a win! P.S. Plus – ACTIVEwear. Which encourages Mom and Daughter to get active, to move, to share. To do physically active stuff. Double win! P.P.S Okay, this is even better! 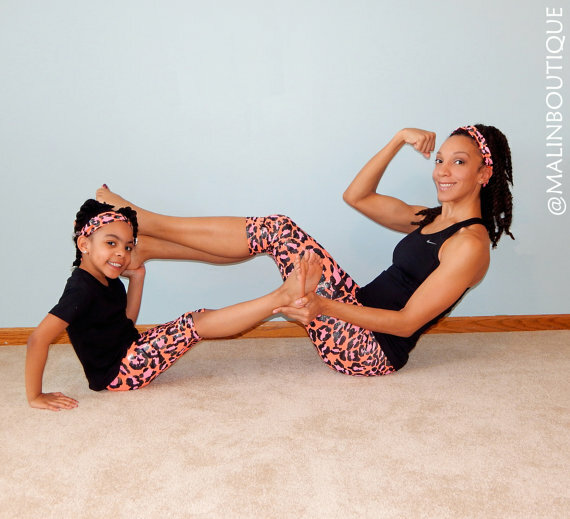 The lovely ladies in the pic above have a Mommy and Daughter workout video over on YouTube – check it out, it is inspiring! You know, if you’re trying to find something fabulous (and also affordable, and unique, and hey even vintage!) as a gift for your Mom – you are SO in luck. 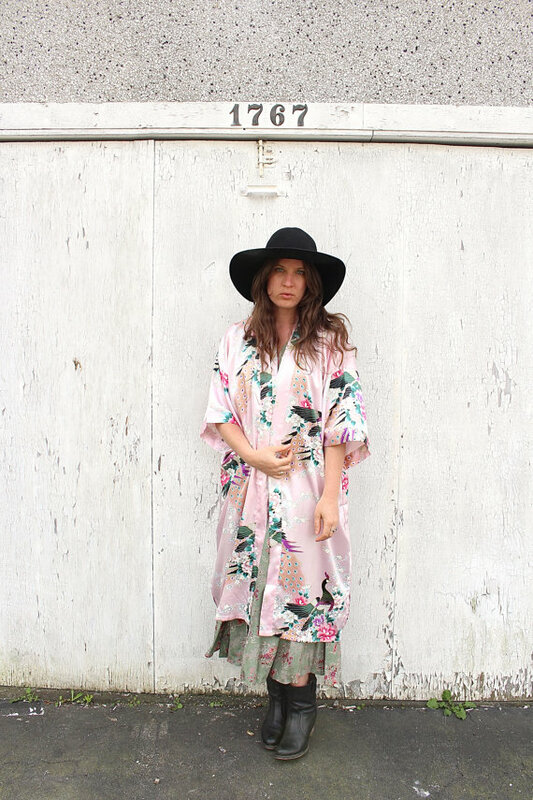 This lovely kimono would be a great robe, jacket, dress, or toss-over-jeans-cardigan-fabulousness for her. Because moms like to look good too. So the big question is… a gift for Mom, or for you? This is not an easy one. But is this not lovely? I would wear it as a dress. Or over jeans. Or, hey, even as a robe except then I would get paint and dirt and dust and dog hair all over it, and I might want to save it for a little more specialness than that. But why not for Mom? She deserves something a little more fun than, what, an apron? You weren’t going to get her an apron, were you? Or a vase of flowers from the grocery store because you forgot to get something? No. Show her how special you think she is (and hey, the bonus is, she’llknow how special you are.) This wonderful garment would be a fabulous gift. No worries about “will it fit”. And it’s silk, which is always classy (and what many people don’t know is that it is super washable, too.) And the colors? Beautiful. I found it at Shudder Emporium, a vintage boutique on Etsy with clothing and accessories and Oddities. You are going to have so much fun over there. Go peek. And if the kimono is gone when you get there, let her know that if she should happen to find more, well, that would be good too. But seriously: such great items, and great prices too? This is a Find! Clear glass can be simple and stunning – it has a lot more “presence” than you might think. I had taken this pic recently, just as a test to see how my mannequin “model” might work for necklace pics. Then a customer wanted to get a guesstimated idea to see how her 18mm x 13mm oval jewels might work as a necklace. The model (mannequin) here is close to life size. A little smaller (and slimmer, because everybody must be a size 2, of course)(pffft!) – but still, it gives an idea. When in doubt, go with the classics. 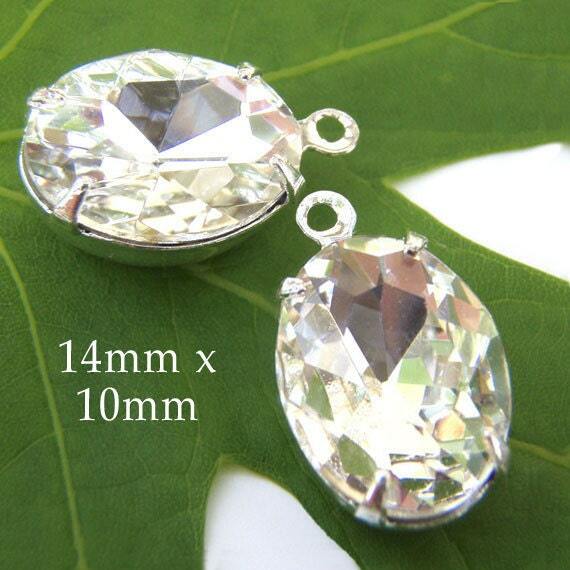 I’ve recently restocked this size and shape – 14mm x 10mm crystal oval rhinestone jewels. Just over 5/8″ long – delicate and pretty. This “mid-size” oval just works, yknow? They’re large enough to be noticed – but not heavy or in-your-face. They’re actually wonderful pendants. They’re great for earrings. I do have two-ring settings available as well, so you can use them for links in your necklaces or bracelets. and, I mean – when you don’t know what color to wear, or you want the reflected light to flatter your face? 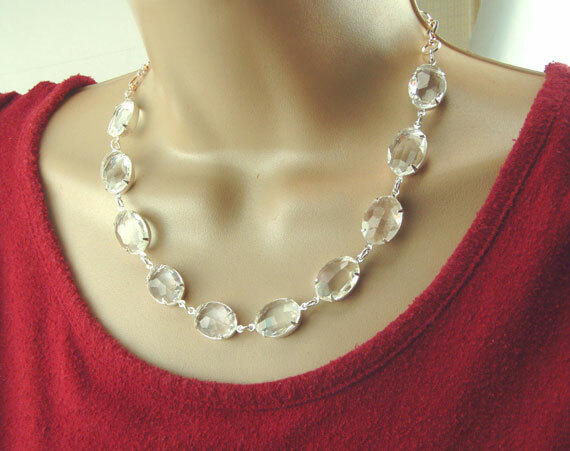 Crystal, faceted jewels. Tiny little bits of sparkle. Girly and gorgeous. Why do you think diamonds are so popular? They look good. They’re easy to use. This is a win. I know, I’ve been on a Green kick lately. 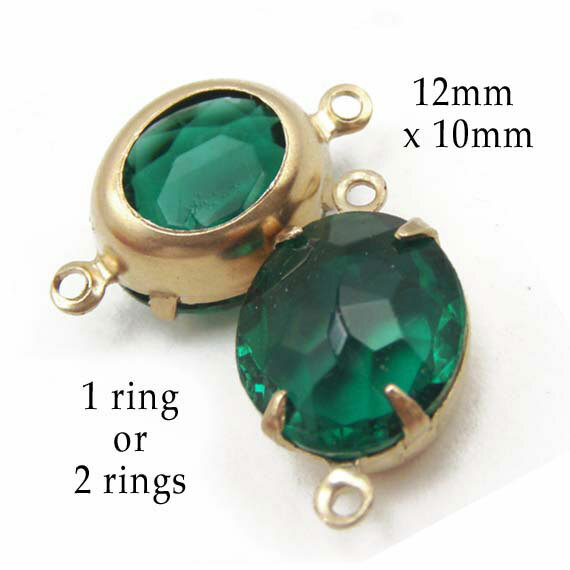 These emerald glass oval jewels are such a great color, and the golden brass settings just make them glow, you know? The brass settings are available with one or two rings – so you can use the oval jewels as earrings “as is”, or add pretty dangles. Or use them as links for your necklace or bracelet creations. The thing is, with this gorgeous color you can go simple – and it’ll look great. Next time I’ll feature another color. Really. P.S. That gorgeous Calvin Klein dress I featured a few days ago, the vintage fabulousness? Not this exact shade of emerald green. But these earring jewels would be perfect with that dress. You know: easy and gorgeous. Vintage Calvin Klein dress. A. Great. Dress. I actually had to modify my comments about this dress. Abbreviated, this is what they came down to: Wow. This is a GREAT dress. I mean, there were a whole lot of things I was going to say, including “cotton and Washable!” and flattering fit and if you have to get some Spanx to wear this dress, do it, because it is still a fabulous value, and you are never going to have a better dress. I mean, that may not be true, you may have a closetful of fabulous dresses. But most of us? A dress like this, that looks great and is effortless and will be fab with no accessories or pile them on, with flats or stilettos, in summer (on cool days or nights) or winter (add a cardigan), and even the color will look good on almost everybody? And it’s easy, and it always looks good, and YOU always look good? How are you going to get a better dress than that? You’re not. This is what clothes are supposed to do – effortlessly, like this. And not only is this vintage and you will not find 20 of them walking around, you will be Unique – but This Dress Is $26.00. Okay, plus shipping. The wonderful woman who is offering you this dress is Victoria, of Bella Amori Vintage on Etsy. She has a great eye, and great values, and she’s got a wonderful shop. I have to say: if this dress ANYWHERE NEAR fit me it would be already sold, and I would simply be telling you about a great shop. Go there. Seriously. 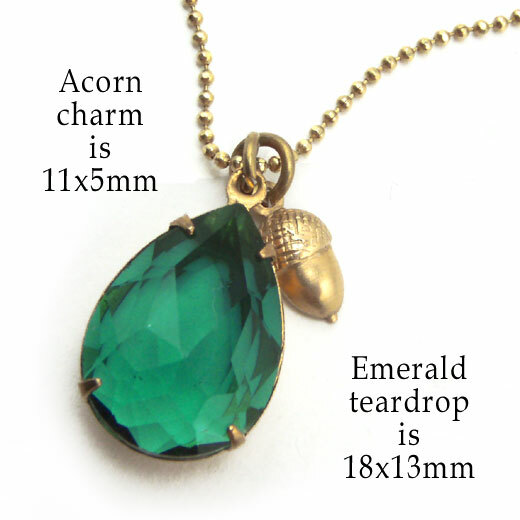 The emerald teardrop necklace is quite pretty all by itself. 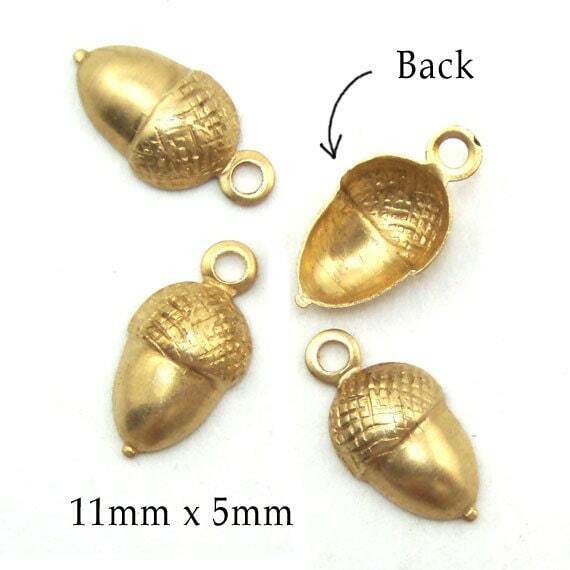 The little golden acorn charm just adds, oh boy it’s hard to resist this – it adds, well, charm. A little quirkiness. I featured these same style charms in silver (see my post here) – and people have been loving them! Small, cute, well-made charms are such a hit this spring. And these are made in the USA – quality all the way. They’re quite sturdy but as you can see in the pic, they’re hollow back – which makes for super comfortable earrings. I don’t know about you, but I’ve pretty much had it with heavy earrings. I’m all for the comfort. And great style. Affordable is nice too, if you know what I mean 😉 Who doesn’t like saving money! Which is one of the great things about DIY. You don’t have to have 10 years experience. You don’t need to invest big bucks. You can do this! Yes, I mentioned right in the title that these gorgeous shoes are Size 10. Why? Because it’s like clothing. Thelarger sizes – no, the not-tiny sizes – are just harder to find. People grab them up quickly. I mean seriously, are these shoes not grabbable! 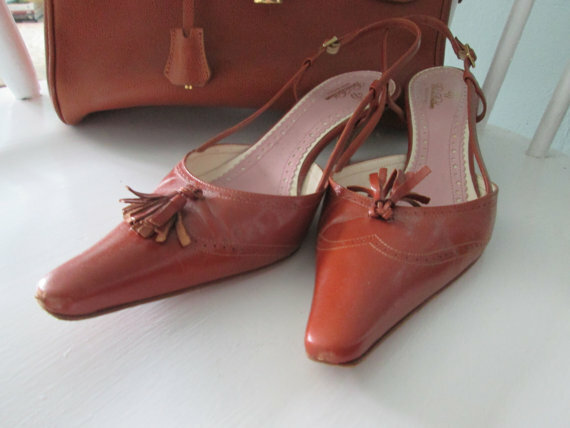 And if you wear a size 10, isn’t it harder to find good, well preserved, fabulous vintage shoes? Yes. And look at the details here – these are great shoes. I found these beauties at a darling vintage shop on Etsy called Preservation Road. Michele, the owner/curator, has some fabulous finds – and a good eye. Even more important, her pics are clear and informative, showing you the info you need to buy online. This skill is all too rare!